The compressive strength of concrete is given in terms of the characteristic compressive strength of 150 mm size cubes tested at 28 days (fck)- as per Indian Standards (ACI standards use cylinder of diameter 150 mm and height 300 mm). 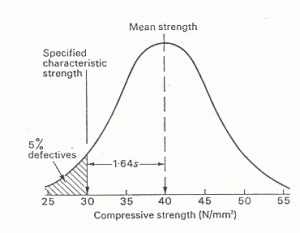 The characteristic strength is defined as the strength of the concrete below which not more than 5% of the test results are expected to fall. Characteristic strength of concrete is the strength of concrete specimens casted and tested as per given code of practice and cured for a period of 28 days; 95% of tested cubes should not have a value less than this value. 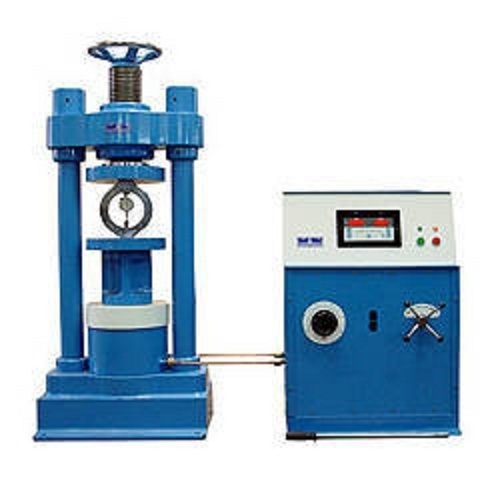 The testing machine may be of any reliable type, of sufficient capacity for the tests and capable of applying the load at the specified rate. The permissible error shall be not greater than ± 2 percent of the maximum load. 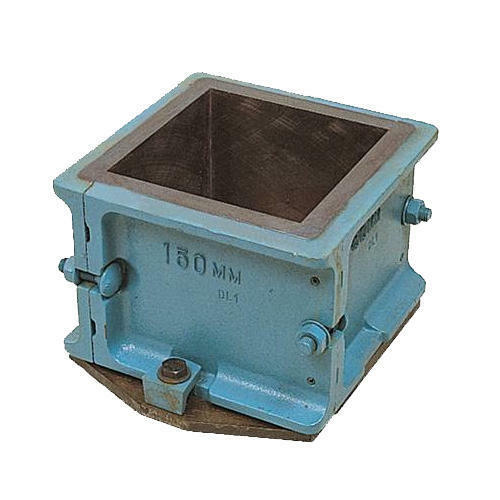 The mould shall be of 150 mm size conforming to IS: 10086-1982. All materials shall be brought to room temperature, preferably 27 ± 3 oC before commencing the test. Samples of aggregates for each batch of concrete shall be of the desired grading and shall be in an air-dried condition. The cement samples, on arrival at the laboratory, shall be thoroughly mixed dry either by hand or in a suitable mixer in such a manner as to ensure the greatest possible blending and uniformity in the material. Care being taken to prevent intrusion of foreign materials. Each batch of concrete shall be tested for consistency immediately after mixing, by one of the methods described in IS:1199-1959. Provided that care is taken to ensure that no water or other material is lost, the concrete used for the consistency tests may be remixed with the remainder of batch before making the test specimens. The period of re-mixing shall be as short as possible yet sufficient to produce a homogeneous mass. Test specimens cubical in shape shall be 15 × 15 × 15 cm. If the largest nominal size of the aggregate does not exceed 2 cm, 10 cm cubes may be used as an alternative. Cylindrical test specimens shall have a length equal to twice the diameter. They shall be 15 cm in diameter and 30 cm long. Smaller test specimens shall have a ratio of diameter of specimen to maximum size of aggregate of not less than 3 to 1, except that the diameter of the specimen shall be not less than 7·5 cm for mixtures containing aggregate more than 5 percent of which is retained on IS Sieve 480. The test specimens shall be made as soon as practicable after mixing, and in such a way as to produce full compaction of the concrete with neither segregation nor excessive laitance. The concrete shall be filled into the mould in layers approximately 5 cm deep. In placing each scoopful of concrete, the scoop shall he moved around the top edge of the mould as the concrete slides from it, in order to ensure a symmetrical distribution of the concrete within the mould. Each layer shall be compacted either by hand or by vibration. The ends of the specimen shall be capped before testing. The material used for the capping shall be such that its compressive strength is greater than that of the concrete in the core. Caps shall be made as thin as practicable and shall not flow or fracture before the concrete fails when the specimen is tested. The capped surfaces shall be at right angles to the axis of the specimen and shall not depart from a plane by more than 0·05 mm. The bearing surfaces of the testing machine shall be wiped clean and any loose sand or other material removed from the surfaces of the specimen which are to be in contact with the compression platens. In the case of cubes, the specimen shall be placed in the machine in such a manner that the load shall be applied to opposite sides of the cubes as cast, that is, not to the top and bottom. The axis of the specimen shall be carefully aligned with the centre of thrust of the spherically seated platen. No packing shall be used between the faces of the test specimen and the steel platen of the testing machine. The load shall be applied without shock and increased continuously at a rate of approximately 140 kg/sq cm/min until the resistance of the specimen to the increasing load breaks down and no greater load can be sustained. The maximum load applied to the specimen shall then be recorded and the appearance of the concrete and any unusual features in the type of failure shall be noted. The measured compressive strength of the cubes shall be calculated by dividing the maximum load applied to the cubes during the test by the cross-sectional area, calculated from the mean dimensions of the section and shall be expressed to the nearest 0.5 N/mm2. In determining the compressive strength, do not consider specimens that are manifestly faulty, or that give strengths differing by more than 10 percent from the average value of all the test specimens. Draw graph between Characteristics Compressive Strength of Concrete versus Time (Days). Fig. 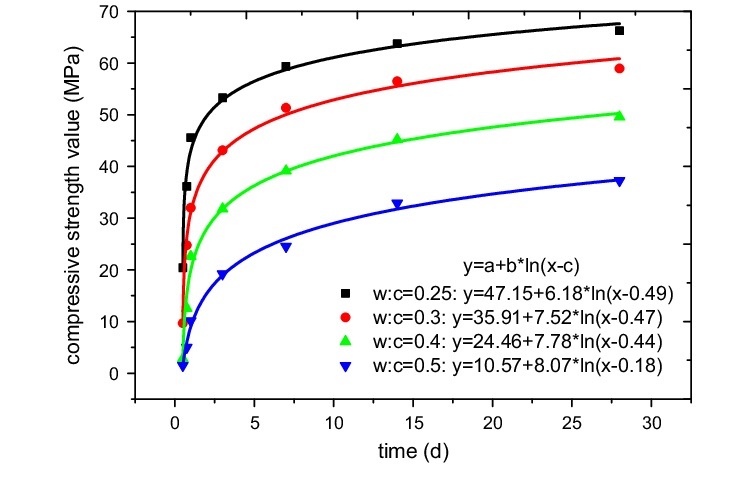 4 : Plot of Characteristics Compressive Strength of Concrete versus Time (Days).